COCOON 560 is formulated to withstand constant washing with harsh cleaners. Used mainly as a wall/ ceiling finish where a tough moisture/vapor barrier is desired. Can also be used to withstand immersion. Used in many situations including dewatering areas, shower areas, swimming pools, vehicle cleaning facilities, laboratories and other areas abrasion resistance, washability, moisture protection, chemical protection are important. COCOON 560 is formulated for protection of surfaces subject to constant immersion. It has maximum surface hardness and very high abrasion resistance. 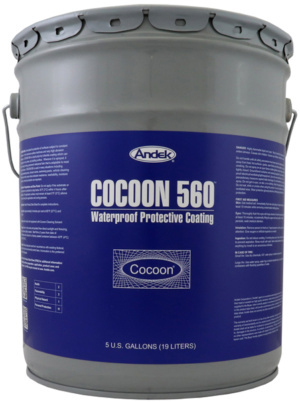 COCOON 560 is a liquid polyvinyl chloride coating which can be sprayed on any clean, dry building surface. Wherever it is sprayed, it forms a tough, strong, permanent waterproof skin that is adaptable to most interior surfaces. 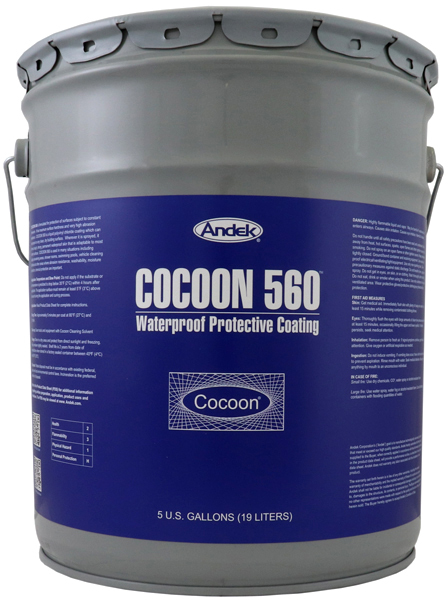 COCOON 560 is used in many situations including sludge dewatering areas, shower rooms, swimming pools, vehicle cleaning facilities and other areas where abrasion resistance, washability, moisture protection, chemical protection are important. A minimum surface profile of ½mm should be maintained for maximum adhesion. After proper masking, prime the entire surface to be coated with Vinyl Bond B, directly from the can, by spray or roller and allow the primer to dry. Close all penetrations through the surface by using a webbing coat. Webbing solution is made by mixing 1 part webbing agent with 3 parts Cocoon 560 to produce a milky, white solution that will support the following coats. Mix ½ gallon of Cocoon Pigment into a 5-gallon can of Cocoon 560 and mix until the color is uniform. Spray apply the mixed Cocoon 560 in multiple overlapping passes until a 20 mil dry film thickness has been achieved. The first should be very light to avoid breaking the webs. Properly applied, the coating should be free of voids and pinholes. Voids and pinholes must be re-sprayed to achieve a complete seal. Prior to the removal of any protection or equipment, a thorough inspection of the entire area should be completed, and all damage or deficiencies must be repaired and re-sprayed. All termination joints should be sealed with a polyurethane sealant. For recommendations regarding equipment, contact our Technical Department. Store in a dry area and protect from direct sunlight and freezing. Protect from moisture and foreign materials. Keep container tightly sealed. Shelf life is 2 years from date of manufacture when stored in a factory sealed container between 50ºF (10ºC) and 90ºF (27ºC).